The seven-story oceanfront hotel will include 100 rooms, a poolside bar and direct access to the Carolina Beach Boardwalk. 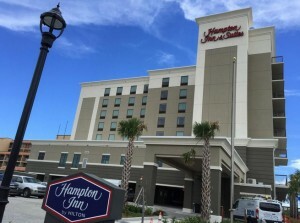 The Hampton Inn and Suites casting its shadow on the Carolina Beach Boardwalk will make its debut just in time for Labor Day. The 100-room, seven-story hotel will open August 30, said Farrah Adams, senior vice president of hotel management company LBA Hospitality. On Tuesday, the hum of construction crew still working could be heard coming from the ground floor parking deck.